Diffuse axonal injury can occur without any direct impact on the head, as it requires only the condition of rapid acceleration/deceleration such as takes place in whiplash injuries due to acceleration/deceleration resulting in rapid flexion-extension movement of the neck. However, the likelihood of significant diffuse axonal injury increases when the head hits something, such as a windshield, as the change in momentum is greater because of the sudden stopping of the head. But in a shearing mechanism, it is not the contact phenomenon which cause the injury, but the change in momentum. 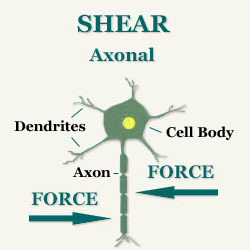 The axons within the brain are long thin nerve fibers that may extend across different layers of the brain, from example the cerebral cortex (the gray matter – on the outside of the brain) to the subcortical region (the white matter – deep inside the brain.) 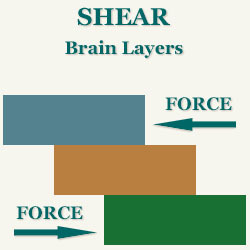 As these different layers of the brain have different densities (weight), and are located at varying distances from the center of a given rotation, they will be accelerated and decelerated at different speeds when a whiplash mechanism occurs. This results in different layers of the brain, sliding across each other, which can put unnatural stress on the axons, which extend across these layers.